RBTH presents a selection of views from leading Russian media on international events, featuring reports on the situation concerning Ukraine’s gas supply, the visit of the President of the European Parliament to Kiev and continued challenges in talks concerning Iran’s nuclear program. Expert business magazine reports that the deadline for the additional agreement between Naftogaz Ukraine and Russia's Gazprom expired on June 30, 2015. However, the conditions for future supplies of Russian gas to Ukraine were not agreed on, which is why Naftogaz is halted its purchases of gas from the Russian company beginning on July 1, 2015. 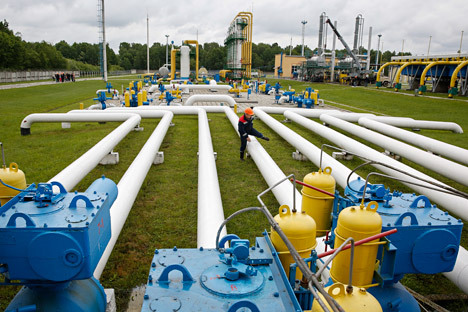 In order to avoid an undesirable escalation in the gas dispute and prevent the risk of interruptions of gas supplies to European consumers in the winter, the Ukrainian and European sides proposed to agree on a temporary solution. According to Naftogaz, Russia has still not approved the proposal and has not agreed to sign the trilateral government protocol. The company hopes that with the European Commission's help the sides will soon come to an agreement on acceptable terms for supplying Russian gas to Ukraine. The issue of the final calculations between Naftogaz and Gazprom will be resolved during the trial concerning the supply contract between Naftogaz and Gazprom at the Arbitration Court in Stockholm. Meanwhile, the transportation of gas on Ukrainian territory for Gazprom's European clients will continue in full accordance with contractual conditions. "Ukraine's decision is a direct result of the fact that the sides did not agree," said independent analyst Dmitri Adamidov. As history shows he suggests, all Russian-Ukrainian gas contracts are made according to the same scenario: the sides do not intend to agree until the last moment, but after all deadlines expire they reach a compromise. "I think it will be the same now," adds Adamidov. "Now Ukrainian transit is primarily an EU problem, which is why Russia will not be particularly active in resolving it." The centrist newspaper Nezavisimaya Gazeta reports that Martin Schulz, president of the European Parliament, is travelling to Kiev on Friday July 3. Citing Ukrainian President Petro Poroshenko, the newspaper writes that the visit will be dedicated to the first anniversary of the signing of the association agreement between Ukraine and the EU. As is expected, Schulz will sign the cooperation agreement between the European Parliament and the Ukrainian Parliament, the Verkhovna Rada. The newspaper recalls that a year ago the sides stipulated that the political part of the agreement, which proposed that Ukraine carry out radical reforms, would begin immediately. The implementation of the economic part of the agreement, however, which proposed to create a free trade zone between Ukraine and the EU, was postponed until January 1, 2016. Nezavisimaya Gazeta adds that last week several European parliamentarians asked the High Representative of the EU for Foreign Affairs Federica Mogherini to establish the position of a plenipotentiary for communications with Ukraine. This meant the creation of a new office in Kiev that would coordinate the process of convergence between Ukraine and the EU. The newspaper remarks that residents of Ukraine reproach the EU for not having enough control over the expenditures and the implementation of the reforms, as well as for the fact that EU leaders have a compromised position on issues related to Donbass. The postponement of the introduction of the visa-free regime also engenders much frustration in Ukraine. Director of the International Democracy Institute Sergei Taran explained that despite the criticism, Ukrainians are not disillusioned with European integration. At the same time, experts say that delays with the reforms and the preservation of corruption schemes may lead to demonstrations against the Ukrainian government and increase the number of people who are skeptical of integration with Europe. The business daily Kommersant is following the talks on Iran's nuclear program. The June 30 deadline, by which time the six international mediators and Tehran were supposed to sign an agreement, was not met. The sides decided to extend the talks by another week. Some Russian experts are convinced that the untying of the "Iranian knot" does not promise anything good for Moscow, since after the lifting of international sanctions Iran would practically become Russia's main competitor in the energy markets and would likely start moving closer to western countries in an active manner. However, in Vienna Russian Foreign Minister Sergei Lavrov explained that Russia is interested in the talks' success no less than the other members of "the group of six." One of Kommersant's sources close to the Russian delegation said that the probability of concluding the deal is at 99 percent. In his words, both Washington and Tehran "need the deal very much." Yet, another diplomatic source close to the negotiation process said that we "should not hurry with predictions." "Prospects are still vague concerning some points in the deal," the source said. "The agreement will probably be signed, however, for resolving the remaining issues a full-fledged round of talks will be necessary between the ministers." Moreover, even if it is possible to resolve all the issues and the agreement is finally signed, there will be many obstacles on the way to its implementation. These include the skepticism of defense “hawks” in the U.S. Congress and the Iranian political establishment, as well as opposition from Israel and Saudi Arabia, Kommersant concludes.